We have seen a lot of rumors on the web regarding the build of an upcoming operating system from Microsoft such as a leak of Windows 9 release date, the inclusion of Start menu in Windows 9, an introduction of Microsoft’s private Visual Assistant Cortana in Windows 9. We have seen this leaks with screenshots leaked by some German and Russian blogs. After being badly criticized for Windows 8, Microsoft wants to win the faith back. We saw many people who used Windows 8 on their desktop returned to Windows XP or Windows 7 due to the absence of old “Start” menu they were astonished and were shocked to see Windows without a start menu. The start menu was Window’s one of the most used feature, and users could not digest the absence of it, and it was very hard for them to search for basic things in the newly introduced tile version in Windows 8. Razer synapse not working Even to shut down the PC, people had to scroll the mouse to the corners of the screen which was sometimes very irritating. But now Microsoft is out with rumors that it will be back with their classic Start menu with a modern touch. The user can Add and Remove apps from the search bar in the start menu. The search bar in Start menu can search the computer and the internet as well. The start menu will automatically change the colors according to the theme you are using. The direct drive access from the Start menu without opening MyComputer. There are many such special features will surprise everyone, especially for desktop users who were not happy with Windows 8 tile version as they did not have touchscreen feature. We hope Microsoft will rock this time with Windows 9. Microsoft will be right back on tracks if it comes with the start menu as people are eagerly waiting for it. Jingle Bells, Jingle Bells, Jingle all the way! Oh what fun it is to imbibe in a radio studio at six in the morning… Merry Christmas, Rich! 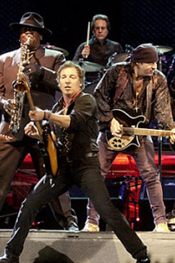 We’ll hear a true masterpiece from Bruce Springsteen and the E Street Band! It was captured live at the HSBC Arena in Buffalo on November 22nd, 2009, during their “Working On a Dream” tour. Not only will we hear timeless rock classics from The Boss, but you’ll surely catch the holiday spirit with their renditions of some holiday favorites! Put a few logs on the fire, pour yourself a glass of Egg Nog, and enjoy our headliner, Bruce Springsteen and the E Street Band! They’re headlining the next Live in Concert. Thurl Ravenscroft, voice of Tony the Tiger, the “Mr. Grinch” vocalist… and the father of “Baker Street” bad boy Raphael Ravenscroft? If not, he should be. This is actually a thing that happened, and people are wondering whether it’s finally killed the whole Live Performance of Whatever Classic Thing You Don’t Want Ruined trend. What say you? Are you one of the eight people who saw it? Call in at 334-321-9001 ‘twixt 6-9 am and tell us about it. We’re here.